Peanut and tree nut allergies are two of the most common food allergies in both children and adults. Unlike tree nuts, peanuts are considered a legume. For this reason, a peanut allergy does not automatically constitute a tree nut allergy. However, most experts do recommend that a person with an allergy to a particular nut avoid all other types of tree nuts. Discuss with your doctor or allergist which nuts are necessary to avoid. 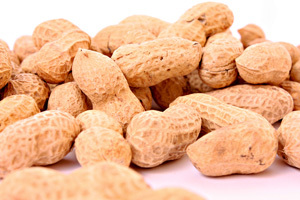 Peanut and tree nut allergies typically appear early in life and are generally not outgrown. The number of children with food allergies, specifically to peanuts and tree nuts, is steadily increasing. Exposure can occur through direct contact, cross contact and even inhalation. The severity of a reaction depends on the amount eaten and how sensitive an individual is. Blood test – A blood test, also referred to as an IgE test, measures your immune system’s response to the proteins found in various nuts by counting the number of specific antibodies in your blood. Eating Out: Eating out can provide an additional challenge. Always be sure to ask detailed questions about ingredients and how the food was prepared – your health and safety are at stake! It may be wise to avoid ice cream parlors, Mexican or Asian restaurants altogether if you are very sensitive to peanuts or tree nuts because of the high risk for cross-contamination in the kitchen. A new diagnosis can be scary. Be sure to build a support of family, friends and healthcare professionals to help you manage your peanut and/or tree nut food allergy. Peanuts and tree nuts are a good source of heart-healthy monounsaturated fats as well as protein. Talk to a doctor or dietitian when eliminating these foods from your diet. They may recommend an adjustment in your meal plan or a supplement to replace nutrients lost by eliminating the offending food and food ingredients. Also talk to your doctor about how to prepare for a reaction. You may treat a mild reaction with oral antihistamines to reduce signs and symptoms and relieve discomfort. If you are at risk for severe reactions or anaphylaxis, your doctor may advise you to wear a medical alert bracelet and/or prescribe an injectable epinephren (EpiPen) to carry with you at all times.